Seventy one percent of all playground injuries occur between the months of April and September. S is for Supervision: A surprising number of parents wrongly assume that their children are safe at the playground, and as such, don’t pay enough attention to what their children are doing, the equipment they are using, and with whom they may be playing. Don’t make this mistake. Be vigilant and supervise the movement of your child in play areas at all times. 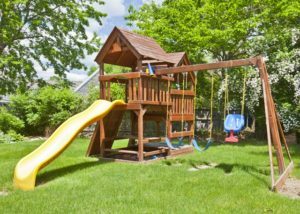 F is for Fall Surfacing: While most of us supervise and are mindful about who our children are playing with, few of us may realize how important the surface cover surrounding play equipment, and the playground itself, is. Red flags include, but are not limited to, asphalt, concrete and other similar abrasive materials. If you notice any of these materials, it’s best to move your child into a safer zone.